Designer Charlotte Ronson Double Wall Ceramic Traveler, featuring a hand sketch and floral prints from her Spring 2013 collection. The double wall construction helps keep hands cool and drinks warm, and the coffee tumbler's press-in lid with slide opening minimizes spills when secured properly. 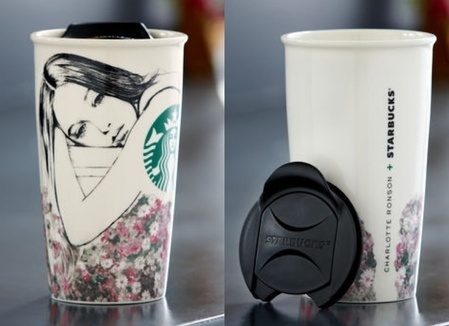 Siren logo and "Starbucks + Charlotte Ronson" on side. No-slip grip pad on bottom. Holds up to 12 fl oz.